From Middle English devil, devel, deovel, from Old English dēofol, dēoful, from earlier dīobul (“devil”), from Latin diabolus, ultimately from Ancient Greek διάβολος (diábolos, “accuser, slanderer”), also as "Satan" (in Jewish/Christian usage, translating Biblical Hebrew שטן‎, satán), from διαβάλλω (diabállō, “to slander”), literally “to throw across”, from διά (diá, “through, across”) + βάλλω (bállō, “throw”). The Old English word was probably adopted under influence of Latin diabolus (itself from the Greek). Other Germanic languages adopted the word independently: compare Saterland Frisian Düüwel (“devil”), West Frisian duvel (“devil”), Dutch duivel, duvel (“devil”), Low German Düvel (“devil”), German Teufel (“devil”), Danish djævel (“devil”), Swedish djävul (“devil”) (older: djefvul, Old Swedish diævul, Old Norse djǫfull). 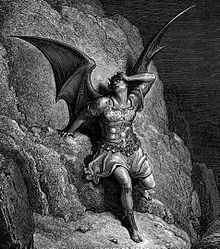 (theology) (the devil or the Devil) The chief devil; Satan. The bad part of the conscience; the opposite to the angel. The devil in me wants to let him suffer. A wicked or naughty person, or one who harbors reckless, spirited energy, especially in a mischievous way; usually said of a young child. Those two kids are devils in a toy store. A thing that is awkward or difficult to understand or do. That math problem was a devil. (euphemistically, with an article, as an intensifier) Hell. What in the devil is that? What the devil is that? She is having a devil of a time fixing it. You can go to the devil for all I care. A person, especially a man; used to express a particular opinion of him, usually in the phrases poor devil and lucky devil. (religion, Christian Science) An evil or erring entity. (dialectal, in compounds) A barren, unproductive and unused area. (cooking) A dish, as a bone with the meat, broiled and excessively peppered; a grill with Cayenne pepper. A machine for tearing or cutting rags, cotton, etc. The stories told by Harris and the other settlers only made people more afraid of the devils. In the 1800s, for example, workers at a wool company were scared that the devils would attack their sheep. (cycling, slang) An endurance event where riders who fall behind are periodically eliminated. To make like a devil; to invest with the character of a devil. To annoy or bother; to bedevil. To work as a ‘devil’; to work for a lawyer or writer without fee or recognition. He did not repeat the scathing estimate of her character by Quatrefages, who at that time spent one afternoon a week devilling at the Consulate, keeping the petty-cash box in order. To grill with cayenne pepper; to season highly in cooking, as with pepper. To finely grind cooked ham or other meat with spices and condiments. To prepare a sidedish of shelled halved boiled eggs to whose extracted yolks are added condiments and spices, which mixture then is placed into the halved whites to be served. She's going to devil four dozen eggs for the picnic. UK usage doubles the l in the inflected forms "devilled" and "devilling"; US usage generally does not.